There is more information available on this subject at Troy Denning on the English Wikipedia. 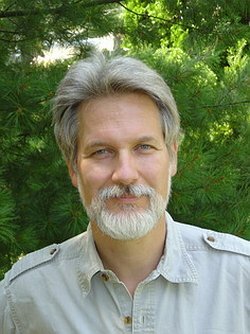 Troy Denning (born 1958) is a fantasy and science fiction author who has written more than two dozen novels. He is the author of the Halo novels Halo: Last Light, Halo: Retribution and Halo: Silent Storm, as well as the short story A Necessary Truth in Halo: Fractures. A former game designer and editor, Denning has written best-selling books in the Forgotten Realm series. He is also well known for a number of his Star Wars Expanded Universe novels. He currently lives with his wife in Wisconsin.